Ponseti Technique for treatment of clubfoot- named after a Catalan orthopaedic surgeon called Ignacio Ponseti - is a revolutionary technique which treats clubfoot largely by physiotherapy rather than by surgery. One of our consultants, a specialist in the technique, introduced it via SGAA to Afghanistan, where it has proved an outstanding success. 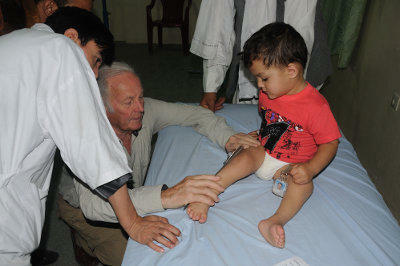 Many Afghan children are, unfortunately, born with this condition, particularly boys. 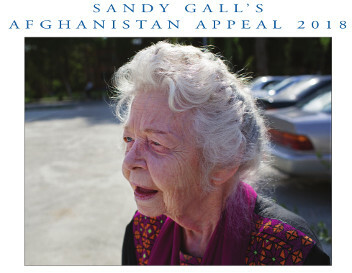 This technique was introduced by one of SGAA’s consultants in Jalalabad in 2005, in order avoids complicated surgery. Instead, the feet are manipulated gradually into the correct position by a trained physiotherapist - provided the child is young enough the bone will be sufficiently malleable and no pain is felt. The foot is then placed in a plaster cast for a week. When the plaster is removed, the foot is realigned and the plaster reapplied, the process being repeated for up to six weeks. After this the patient is given soft boots attached to a metal bar. The child can kick his or her legs but the feet stay at the right angle. The boots are worn night and day until the child is walking age and then only at night for up to 4 years of age to prevent recurrence of the deformity. A closed tenotomy (a small cut to the Achilles tendon) by a surgeon is usually needed before the final plaster is applied. 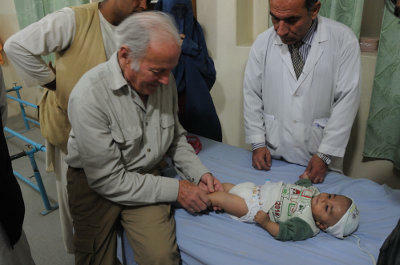 Zohal was born with bilateral clubfeet and came for treatment when she was ten months old. She was the first patient of orthotist Ahmad Shah to be treated using the Ponseti method and now 6 she proudly shows him how well she walks. All the Afghan physiotherapists working with SGAA and SCA have been trained since 2006 by SGAA’s expatriate consultants and are now sufficiently skilled to practise the technique. So successful has the treatment proved that babies often only several days old, arrive at the physiotherapy clinics from all over the country. The parents have often heard of the treatment by word of mouth. .Due to the intensive nature of the treatment, children who do not complete their treatment risk having a relapse of the club foot so a lot of advice and counselling must be given by the physiotherapists to prevent this. Transport payment is also given for very poor families so that they will continue to bring their child until the end of the treatment. Since the club foot programme started over 1,000 children a year, under the age of 2 years, have been treated in SGAA’s/SCA’s clinics. SGAA’s senior physiotherapist also conducted training sessions for ICRC (International Committee of the Red Cross) in Herat and Kabul. 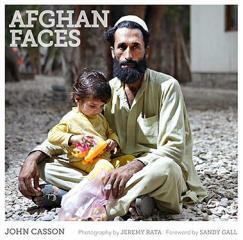 DDH (Developmental Dysplasia of the Hip) or ‘clicky hip’ affects a disproportionate number of baby girls in Afghanistan. International estimates are one child in a thousand is born with this condition. DDH means when the child starts walking he or she has an ugly limp which is difficult to correct and which requires complicated surgery. However if the condition is identified soon after birth, simple splinting can result in nearly 100% success. There is no screening system amongst babies for this condition, so to address this SGAA’s expatriate consultants started providing training in 2009 to their physiotherapists in how to identify this condition in small babies and how to treat it with a splint (Pavlik harness). However, the physiotherapists see very few newly born babies – most are born at home in rural areas with community midwives or traditional birth attendants doing the deliveries. In the cities due to better education and access more women do go to maternity hospitals or clinics to give birth to their child. Doctors and midwives in Afghanistan are not trained to diagnose this condition which only becomes evident once the child starts walking. A project was piloted in Samangan Province in 2010 together with SCA’s health programme which was responsible for two district hospitals and over 20 basic health clinics. Local health staffs in the hospitals and clinics were trained in the risk factors of the condition and were asked to refer babies to the physiotherapy clinic in the capital city Aibak for screening. Babies born at home and in clinics and hospitals in Samangan are now regularly referred by midwives, vaccinators and doctors to the physiotherapists and an orthopaedic surgeon. The Pavlik harness pulls the knees up in an abduction position and encourages the hips to form normally. The baby usually has to wear the harness with adjustments for 12 weeks. In the first 12 months of the project in Samangan 137 babies were referred for screening, 25 were identified as positive cases and then given harnesses to wear.